Welcome to the forum, Karlo. Burgundy was a transparent red finish that was available in '75. Ruby was a solid metallic finish that was not available until about '80. This is my 4001FL Burgundy. You can see the figured pattern in the maple. The fretless basses that RIC builds have dot fingerboard markers. I changed the control knobs to the vintage style and if you look closely I also swapped out the neck higain for a toaster pickup. 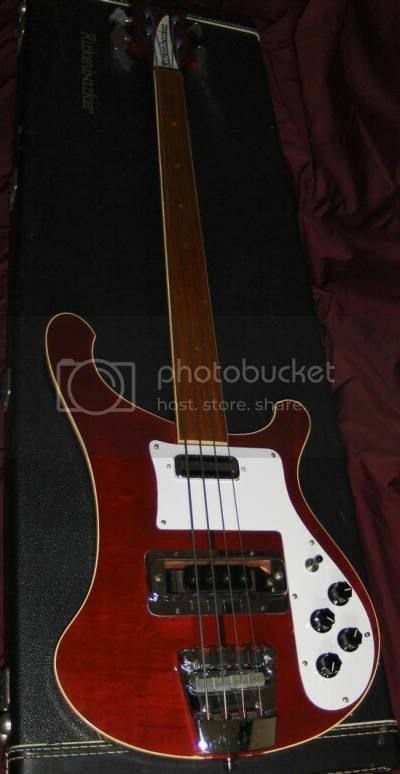 I just scored my first BG Rickenbacker myself a few months back. It is a 2002 Burgundy 620 which was the last time RIC produced the colour.